In the current proposal, 75% of the businesses between Olney Elementary School and Route 108 — a three block area that is a significant portion of the town’s center — are targeted to be acquired for right-of-way. This includes The Backyard Naturalist and our neighboring businesses. Additionally, there is a proposal for a new special tax district in Olney to help defray the costs of construction and management of the system. This is projected to include property tax increases and a special business surcharge. There’s more info below on “Maryland Senate Bill 627”. If you are a resident of Maryland, particularly Montgomery County or the Olney area, we ask you to respond. During this planning stage, The State Highway Administration, our elected officials and local business associations need to hear from citizens, particularly if you disagree with their proposals. No feedback equals approval. We want all residents of Montgomery County to have full information and input on this matter. We’ve added a list of some of the key deciders on this issue. Please email your comments and copy Carmaletta Harris, charris@sha.state.md.us on each message. She is the Project Manager at SHA and is coordinating responses from the public. See the Countywide Master Plan. Read ITDP’s Demand & Planning Report to MC DOT. 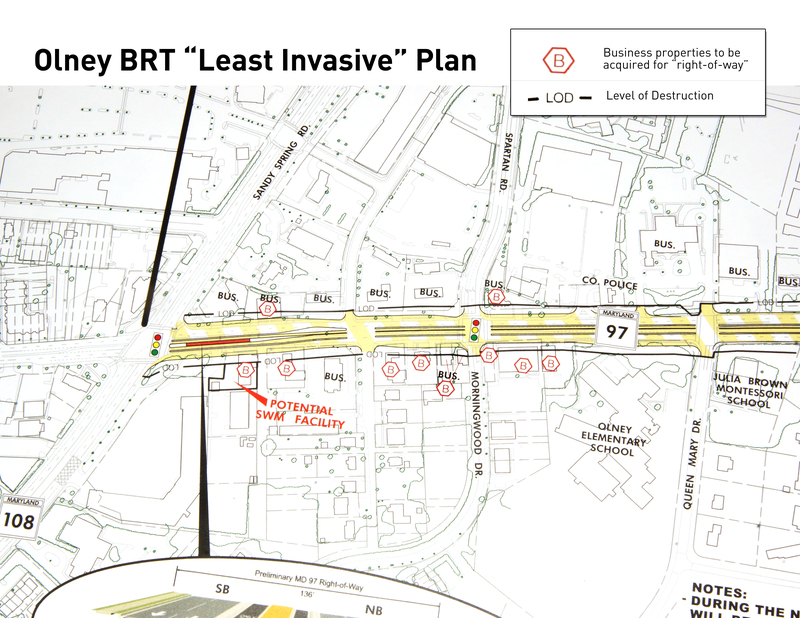 See map of “Least Invasive” Plan for Olney. Read The Backyard Naturalist Backyard Blog post Olney BRT Project Raises Concerns. How Will the BRT Project Be Funded? In January and February, bills were introduced to the Maryland General Assembly, Special Taxing Districts – Transportation Improvements and Exemption From County Tax Limitations. Introduced in the State Senate as Bill 627 by Senators Richard Madaleno, Ulysses Currie, Verna Jones-Rodwell, and Karen Montgomery. Read and download Maryland Senate Bill 627. See supplemental notes on Maryland Senate Bill 627. Monitor progress of Maryland Senate Bill 627. Cross-filed with Senate Bill 627, House Bill 1279 was read to the House by sponsoring Delegates Hixson , Barnes, Barve, Carr, Cullison, Gutierrez, Hucker, Luedtke, S.Robinson, Simmons, Waldstreicher, and Zucker. Download a copy of Maryland House Bill 1279. Please copy Carmaletta Harris, Project Manager, on all your emails.